"Who says kids aren’t reading? I find myself constantly defending kids and their reading habits to adults who seem to feel that kids aren’t reading at all, distracted by texting, computer games, and really bad movies (really, Jackass 3D?!?!?!?). Thirty five years after I was in junior high (go ahead, I’ll wait while you do the math) I am FINALLY cool to teens BECAUSE I read their books (believe me when I was an actual junior high student I was anything BUT cool). I find I can talk to almost any kid because I just ask them what they’re reading and then the conversation goes from there. I do not cut down their tastes (even if they’re reading Twilight, we are all allowed our ‘trash’ reading) and I love to hear how they view various characters and plot. We know the stereotype of 8th graders: too cool for words, into fashion, video games, boys or girls and perhaps sports. Excited about a book? Nope, that’s not what we think of. Well, let me tell you about my morning. Today, I paid a surprise visit to my daughter’s 8th grade Language Arts class (YES, I asked her permission first, so it wasn’t a surprise to her, just the teacher and her classmates). 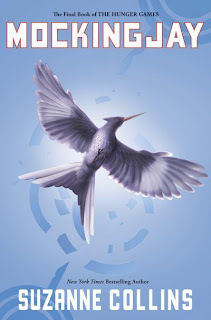 I had gone to Kepler’s (our local, independent bookstore) to pick up Mockingjay, the final book in Suzanne Collins’ Hunger Games trilogy that was just released today (August 24). Of course, I also handed a copy to my daughter, so she can start reading it during SSR (Sustained Silent Reading) today (why else do you think she gave me permission to come into her class on the second day of school?). I left with a huge grin on my face and realized that I had not said a single word while I was in the room. I didn’t have to, the book said it all." Sharon is an incredible resource for parents, teachers and authors. She runs a children's literature email list which updates San Francisco Bay Area folks on upcoming events and releases. If you are interested in joining her list, email her at: sharonlevin(at)mindspring(dot)com. I haven't had a chance to finish Mockingjay yet, but my favorite teen reviewer said that the ending just grabs you and won't let you go. It's a great choice for teens who like fantasy/sci-fi and adventure, but who also want to get into the emotions characters are experiencing. Thank you very much, Sharon, for sharing your enthusiasm and insight. Please note, if you make a purchase on Amazon using the links on this page, a small portion goes to Great Kid Books (at no cost to you). Thank you for your support! 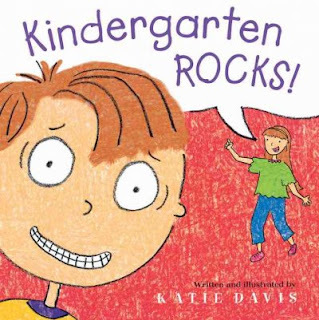 Help ease the transition back to school by sharing these funny books with your children. They both provide a silly view of school routines, inspiring laughs and celebrating imagination. 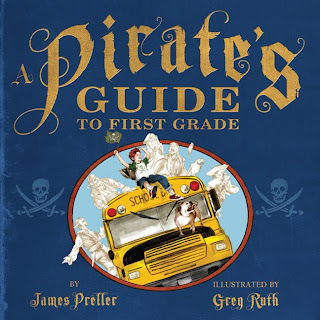 Take a rollicking spin on the first day of school with James Preller's newest book, A Pirate's Guide to First Grade and follow a young boy narrating the story of his first day of school entirely in pirate lingo. 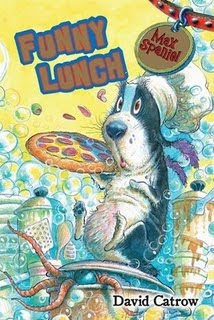 As he wakes up for the day, he says “Me great scurvy dog slurped me kisser when I was tryin' t' get me winks!” This makes story for a great read aloud, hamming it up along the way. The illustrations show kids looking like real kids in bright, bold colors, and then faint ghosts of pirates that the narrator sees throughout his day. I absolutely loved the humor and the way it celebrates boys' imaginations. Preller is the author of many books, including the Jigsaw Jones series and several novels for older children. He really understands the inner workings of kids and how they see the world. Is your child a little bit nervous about starting kindergarten? This is a great book to ease their fears by making them laugh at the situations this silly buffalo gets into. I mean, look at the grin - you couldn't help but love a buffalo like that?! Certain rules like No Grazing at recess might be hard for a buffalo to learn, but they will be great at hide-and-seek. Your buffalo will also have to learn about sharing and not losing his temper -- no butting heads in kindergarten! 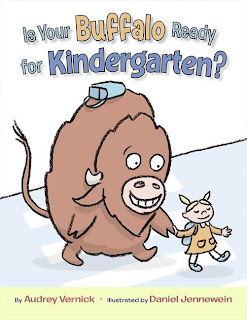 Not only does this book help little kids become more comfortable by laughing at the buffalo, it also helps them see the typical routines of the classroom. The review copy of Pirates was shared by my local independent bookstore, the wonderful Mrs. Dalloway's Books in Berkeley. The review copy of Buffalo was kindly sent by the publisher. If you make a purchase on Amazon using a link from this page, a small portion will go to Great Kid Books (at no cost to you). Thank you for your support! Schools are starting throughout the U.S., and little kids are getting ready for their first day of kindergarten. It's a huge transition - being in a big school with so many big kids. I'd love to share three books that talk about being a new kid in school. They help kids envision what school's like so that the routines are familiar. "I don't want to go to Big School with big kids. What if they're mean?" worries Annalina on the day before she starts kindergarten. But her mom insists that she really has to go to school, and here we have her diary of her first month in kindergarten. I loved how this story really helped get inside the feelings of the child, showing what's scary and fun about school. The illustrations are lively and fun. Annalina has a wonderful imagination. When she worries that her teacher will be scary, she imagines a fierce monster teacher spewing out the alphabet. When she and her friends try to get across the monkey bars, they pretend they're in the jungle and then in outer space. Annalina’s diary finishes on the last day of September -- there are just too many fun things to do to keep writing! Annalina's voice is fresh and authentic. 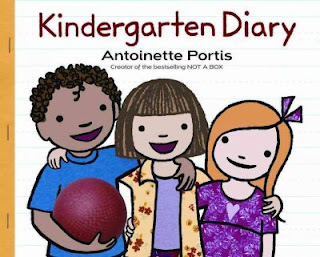 Head over to You Tube to watch this video of the author, Antoinette Portis, talk about her inspirations for writing the story and see some of the illustrations. Dexter isn't scared about starting kindergarten, but his stuffed dog Rufus is a little nervous. So Dexter's older sister Jessie helps reassure Dexter and Rufus that kindergarten will be fine. "Rufus is scared I'll get lost on the way to school," says Dexter. "The bus driver knows the way. Don't worry, kindergarten rocks," reassures Jessie. Dexter finds out that kindergarten is lots of fun, and he gets to write letters, cook food, and play in the school's imagination station. The cartoon like drawings, with speech bubbles and bright colors, will draw kids in and reassure them. This is one of my favorite books to read. In an exceptionally clever alphabet book, Miss Bindergarten and her new students get ready for the first day of school. "Adam Krupp wakes up. Brenda Heath brushes her teeth. Christopher Beaker finds his sneaker. 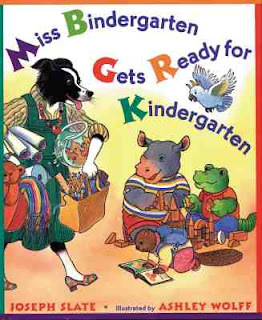 Miss Bindergarten gets ready for kindergarten." Adam is an alligator, Brenda a beaver, Christopher a cat; throughout the book, each child's name corresponds with the next letter in the alphabet, and each animal also matches that letter (there's a helpful chart at the end). But you also watch as the friendly Miss Bindergarten (a dog) prepares her classroom, sweeping, dusting and making it cheerful and welcoming. The short rhymes are fun to read aloud, and the illustrations are filled with details and humor - this makes a perfect book for pouring over time after time. The review copy of Kindergarten Diary was kindly sent by the publisher. The other books came from our public library. If you make a purchase using the Amazon links on this page, a small portion will go to Great Kid Books (at no cost to you). Thank you for your support! Once in a while, I read a book that pulls me into a different world and wraps me the threads of its characters' stories. Keeper, by Kathi Appelt, is a mesmerizing, beautiful story that is one of the very best books I've read in a long time. It would make a wonderful family read-aloud, with many themes or issues to talk about and beautiful writing to enjoy. Ten-year-old Keeper has had a terrible day. Everything went wrong, and it was a blue moon - it was supposed to be a perfect, extra-special day. But no, the stupid crabs ruined everything. But Keeper has a plan - she will set things right. Her mermaid mother will know just what to do, if only she can find her. Then all will be right in this small part of the Texas coast, Keeper's world all unto itself. So Keeper and B.D. (Best Dog) climb into a small row boat and let the tide pull them out into the Gulf to the sandbar where Keeper is convinced her mother will find her. This is a complex, layered story that weaves flashbacks to flesh out the stories of each resident of Oyster Ridge Road, a small fictional town on the Gulf coast of Texas. Keeper's mother left when Keeper was three, and Signe has been raising her ever since. Dogie, their neighbor and good friend, runs a surf shop out of his bus. He's a war vet who has been in love with Signe for ten years. And Mr. Beauchamp, a man as old as barnacles, is waiting for a wish to come true. Appelt draws the threads of each of these characters, sharing their flashbacks and memories, as they deal with the disappointments of this blue moon night. There's a note in the final acknowledgments that stuck with me. Diane Linn asked Kathi Appelt to "consider heartbreak over anger." That's a weighty sentiment, and it shines through this wonderful book. Each character wrestled with their pain and heartbreak, but each comes through because they don't succumb to anger. And the people and animals in this small corner of the universe turn to those they love to find their strength and grounding. I also loved the nontraditional family that comes together in this story. It felt completely natural, one that children will be drawn to. Dogie and Signe's love is inter-racial, and that is not an issue at all. And Mr. Beauchamp recalls his poignant love for another boy many years ago, when they were both 15. Ms. Appelt does a wonderful job drawing these relationships in a subtle, but heartfelt way. I'm concerned that students will find the complex structure difficult, but I firmly believe it's important to share all types of stories with students - not just straightforward, action-driven plots, but also stories that weave together many strands to make a complex tapestry. Even more importantly, it's important not to underestimate what kids can absorb. Let them ask questions, let them know it's OK to muddle through, but encourage them to read stories that speak to them. And Keeper will speak to kids. She's an authentic character, a kid full of hopes and fears, a kid who's determined to try to fix things all by herself, a kid who knows about the moon and the tides but who also firmly believes in mermaids and magic. Would you like to read the first few chapters? Head over to Google Books to give it a try. Brenda at proseandkahn: "Charming and memorable... Keeper begs to be discussed at any age." Betsy Bird at Fuse #8: "Where The Underneath examined hate and bitterness, Keeper is about love, family, and forgiveness." 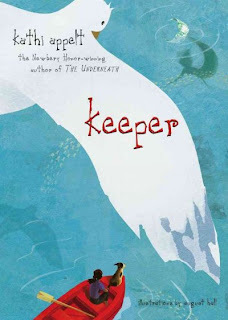 Many thanks to my good friend, Kathy Shepler, librarian extraordinaire at Aurora School, for recommending Keeper. The review copy came from Amazon, paid for by support from readers through the Amazon Associate program - thank you so much. If you make a purchase using the Amazon links on this site, a small portion will go to Great Kid Books (at no cost to you). This enables us to purchase more new books to review. Thank you for your support! "Too silly" is my giggling six year old's verdict of Funny Lunch, by David Catrow. That's a great recommendation, if ever I've heard one. If you have a kindergartner or first grader who's reading one or two sentences on a page, find this book. The humor will have them coming back for more. Max Spaniel, the star of Dinosaur Hunt, is back for a second installment in this laugh-out-loud series. Here, Max is in the kitchen. He is not a dog - he is a chef, a chef who loves pizzas! When one customer refuses the special of the day and orders chili instead, Max gives him a scarf, hat and mittens - so he won't be "chilly" any more! When another orders a hot dog, a panting dog with a fan is served. Our favorite section was when a tour bus arrives and orders 100 pizzas. Can Max live up to this challenge? The review copy came from my local independent bookstore, Mrs. Dalloway's in Berkeley - stop by to browse a wonderful selection of children's books. If you make a purchase on Amazon using a link on this blog, a small portion will go to Great Kid Books (at no cost to you!). Thank you for your support! I have exciting news to share: in a few weeks I will be starting a new job as the librarian of Emerson School in Berkeley, CA. This is a wonderful public elementary school, very close to our home. They have a supportive community, a thriving staff, and a lovely library. I will be following the footsteps of an amazing librarian, Claire Scott. The Berkeley community is so lucky to have a dedicated tax source directly supporting the school and public libraries. I will still be connected to the Redwood Day School Community, the independent school where my children attend. While I won't have nearly as much time to volunteer at RDS, our relationships with friends and family will continue to thrive. This is an important step as I branch away from the school my children attend and develop my professional life outside their school lives. I feel tremendously grateful for the opportunity to work at the RDS library for the past three years - it's been a chance to grow and learn so much. Professionally, this is a wonderful step for me - something I've been aiming at for the past three years. I'm ready to spread my wings and soar, and can't wait to develop relationships with all the children at Emerson. Personally, this will be a big juggle for all of us, as I venture back into nearly full time work. I will also continue pursuing my Masters in Library and Information Sciences. I hope that I can handle all this new work. I am especially grateful for the support and encouragement from my family. We're packing up for our last summer vacation. It is exhausting packing, but so worth it. We'll unplug and unwind, spend time together and time visiting with friends. I won't be posting this week, but wanted to give a quick report on what we've been reading. This has been a summer of reading for my youngest (age 6), as she reads her picture books along with me and loves listening to chapter books. We're having fun with Winnie-the-Pooh. Watching her giggle as I read the chapter about Piglet and the Heffalump was priceless - she thought it was hilarious that Piglet was terrified and didn't realize that it was just silly old Pooh with the honey pot stuck on his head. Milne was masterful at bringing children in on the joke, making them feel so much smarter than that silly old bear. My middle daughter really hasn't read as much as she usually does during the summer. She loves to draw, and is determined to learn how to draw figures that match her imagination. So she's listening to audiobooks as she draws for hours. I'm just downloading The Guardians of Ga'hoole audiobook, hoping that the movie preview will entice her to this series. My oldest daughter will devour a book when she finds one that she likes. But she wants to discover the book - not mom. So I leave books lying around, and hope that one sticks. Her favorite book from the summer has probably been Shug, by Jenny Han - a wonderful summer book for tweens on the edge of romance. And for me? I've loved being able to stay up late reading. I've loved Word After Word After Word, by Patricia MacLachlan. I also loved discovering Philip Reeve, and English author I hadn't read before. And I have Keeper, by Kathi Appelt packed in my bag (OK, I confess, with about 6 other books as well... a girl can dream!). I hope your summer has been filled with time with family and friends, time to recharge your batteries, and time to sink into a good story. School and busy routines will be here before we know it. As we head into the home stretch of summer, I think of time we can spend with old friends - friends we see every summer. But summer is also a time for kids to make new friends - at summer camps, in the neighborhood, at the park. Mo Willems and Jon Muth have teamed up to bring us a wonderful book about friendship: City Dog, Country Frog. It's a book that will touch your heart and bring a smile to your face. When spring comes, City Dog is thrilled to come to the country, running without a leash, exploring the woods and the pond. He spots Country Frog sitting on a rock by the pond. Asked, "What are you doing?" Country Frog smiles and replies, "Waiting for a friend…but you'll do." They play games, and Country Frog teaches City Dog about splashing and croaking. In the summer, City Dog returns and races to see his new friend. In the fall, Country Frog is tired. “Maybe we can play remembering games.” And so they spend time together remembering jumping and splashing, sniffing and barking. Winter is a lonely time, as City Dog cannot find his friend. But spring returns. City Dog once again races to the pond. Frog is not there, but a chipmunk spots something she has never seen before – City Dog. And a new friendship begins. Mo Willems is the author of the Pigeon books, the Elephant and Piggie books, the Knuffle Bunny books, and the Cat the Cat books. Here he shows a much more tender side, but as always shows that he has his pulse on children's emotions. Jon Muth has written and illustrated many books, including Zen Shorts and Three Questions. He is an incredible painter, creating just the right blend of human emotions and dog qualities to elicit real empathy for this dog. City Dog, Country Frog has been at the top of the NYTimes Bestseller list for 8 weeks since publication. Hooray! Kids Lit: "Highly recommended, this pairing of author and illustrator has created an amazing story that is deep and moving." A Year of Reading: "Mo Willems is brilliant about saying so much in so few words." NY Times: "The light-filled watercolors by the celebrated Jon J Muth, whose “Zen Shorts” was both a best seller and the winner of a Caldecott Honor, beautifully illustrates the changing landscape and emotional high points of the story." The review copy was kindly sent by the publisher. If you make a purchase using the Amazon links on this page, a small portion will go toward Great Kid Books (at no cost to you!). Thank you for your support. My grandfather used to tell me that you needed a little luck and a lot of hard work to do well in the world. You couldn't do it just with hard work - everyone needs some luck to get by. He was a man who pulled himself up from the bootstraps, the first in his family to go to college, and he worked hard to do well. But he was always aware how luck played such an important role - it was his way of being grateful for what the universe brought his way. 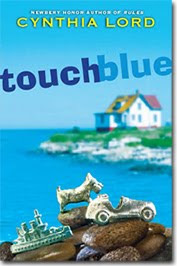 When I read Touch Blue, by Newbery award-winning author Cynthia Lord, I thought a lot about luck, how you call it to you, and how you just need to let it come and be grateful for the luck that you have. Eleven-year-old Tess Brooks believes that you can help bring luck your way if you do a few simple things. "Why take chances?" says Tess. "Especially when it's so easy to let the universe know what you want by touching blue or turning around three times or crossing your fingers." Tess and her family have lived on Bethsaida Island, off the coast of Maine, for as long as she can remember. Her father is a lobsterman, and her mother is the island’s school teacher. But the state is saying that the school has too few students to keep open. Tess’s family and other island families decide to take in foster children to help keep the school open. Aaron is a brooding, quiet 13 year old who misses his mother terribly, and wishes he were anywhere else but in this new home. Tess worries that if Aaron really hates living with them, he will run away, the state will close their school, and she will have to move away from the home she loves. Aaron is desperate to see his mother again, and Tess decides to take a big risk to help him see his birth mother again. As Tess and Aaron adjust to the changes in their lives, they each come to know themselves a little better, know what’s important, and how to make their own luck. This is a wonderfully quiet novel, one that seeps under your skin and stays with you. The characters’ emotions ring true: they are neither simplistic or blown out of proportion, but rather feel honest as the reader comes to know Tess and Aaron. Here are two lines that really spoke to me. I'm sure they say as much about me as they do about the novel, but I thought they were powerful. This is a wonderful book to read aloud with your child - full of moments to ponder, to appreciate, to enjoy. The review copy was kindly sent by the author. If you make a purchase using the Amazon links on this page, a small portion goes to Great Kid Books (at no cost to you). Thank you for your support.